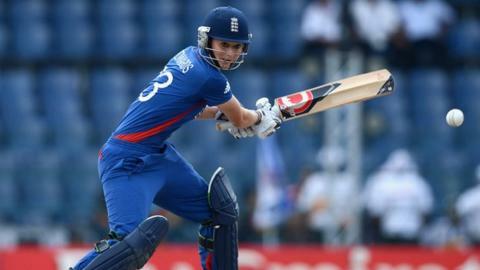 England captain Charlotte Edwards says their fielding must improve after dropped catches cost the defending champions in their World Cup opener. Edwards's side suffered a shock one-wicket defeat by Sri Lanka in Mumbai. Eshani Kaushalya (56) was dropped twice and Yasoda Mendis (46) once as Sri Lanka reached their target of 239 from the final ball of the match. "If we'd held our catches we might have won the game by 30 runs, but we paid for that," said Edwards. "It's hard to take wickets in India, which is not helped when you don't field well. It's an area we need to improve." England, without the injured Sarah Taylor, had earlier slipped to 29-3 before recovering to post 238-8. An opening stand of 103 between Mendis and Chamari Atapattu put Sri Lanka on course, but when they fell England looked to have regained control. However, Kaushalya's 41-ball blitz, in which she was dropped by Jenny Gunn and Georgia Elwiss, proved decisive. "I thought we did well to get up to 238, but we let things slip towards the end," continued Kent batter Edwards. "Bowling is also a slight concern at the moment, really squeezing those middle overs. "We're bitterly disappointed, it's not the ideal start to a World Cup, but a lot of credit has to go to Sri Lanka." However, seam bowler Elwiss, who was hit for two sixes in the final over of the match, believes England's batters must also take some responsibility for the defeat. "We weren't good enough today, 270 would have been a par total," she told BBC Sport. "We can't blame the conditions. We knew the ball was going to be doing a little bit early doors. "We were ready, we were prepared. We just didn't bring our 'A' game and they did." England next meet hosts India on Sunday before playing West Indies on Tuesday, knowing they are likely to have to win both games to guarantee qualification for the Super Six stage. "We haven't got long between games. That's the situation we're in," said Edwards. "I don't want to put too much pressure on the girls, we know we can beat India in India and we've got to believe that we can come out on Sunday and do that."